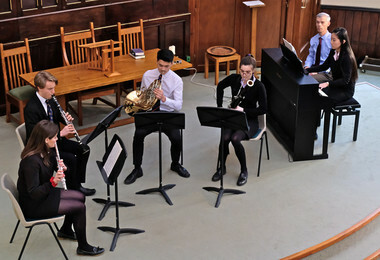 This spring, College musicians from both the Senior and Prep School have given a series of lunchtime concerts at Water Lane United Reformed Church. Returning to Water Lane marked an old association between the College and the United Reformed Church, whose historical links with the College go back to 1868 when the College was founded by a group of Non conformists. 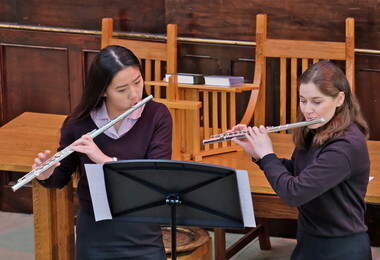 These lunchtime recitals are an annual fixture in the Music Calendar at Bishop's Stortford College. They are open to the public and are free of charge. You can read about our recitals below. 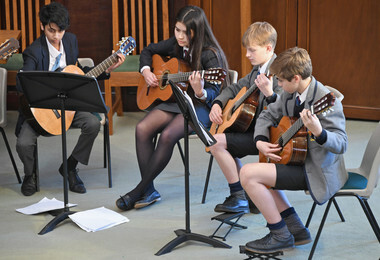 Senior and Prep School guitarists gave a wonderful recital on Thursday 14th March. 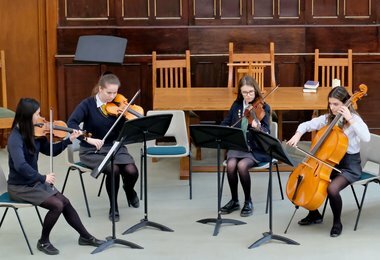 On Thursday 7th March, musicians from both the Prep and Senior School performed in a superb Chamber Music Recital; to view the programme please click here. 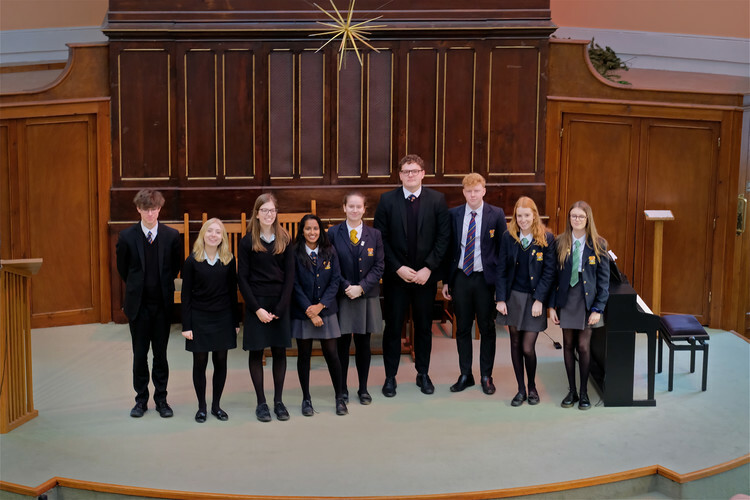 A group of talented Senior School singers performed to the audience in United Reformed Church on Thursday 28th February. 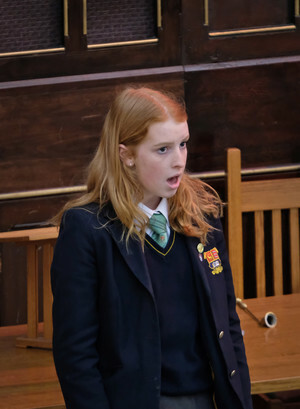 The first of the lunchtime concerts after the half term break was dedicated entirely to the voice. 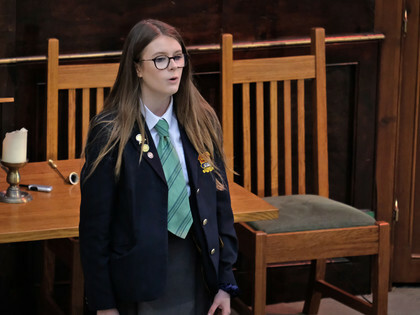 We have a rich choral tradition at the College, and we also encourage and nurture our pupils to be excellent vocal soloists. This was clearly in evidence at this Singers’ Concert at Water Lane United Reformed Church last Thursday. There were a number of excellent performances of various songs, that ranged in style from traditional American folk, English classical, pop and musicals. Heather C and Anna B started the recital with a lovely duet “Flight” by Craig Carnelia, which as followed by a delicate and moving performance of “Fear no more the heat of the sun” by Thomas P-M. Vibha M and Edward B sung arrangements of two traditional songs “Shenandoah” and “The Sally Gardens”. 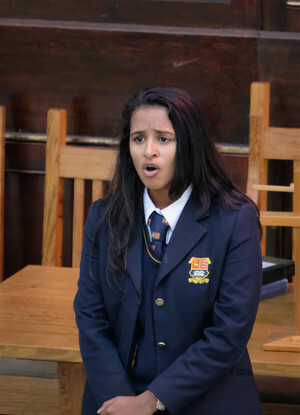 Fifi D returned to the stage after her harp performance last week to sing “Someone like you” from the musical Jekyll & Hyde, and Holly H recreated the part of Consuelo in the musical West Side Story by singing “Somewhere”. Finishing the recital we had to outstanding performances also taken from musicals. Harry B performed a powerful and emotional rendition of the song “Run away with me” and Billianna I finished the recital with a charged and intense performance of “On my own” from Les Misérables. The audience reaction was very positive and there was an abundance of superlative descriptions regarding all of the performers. 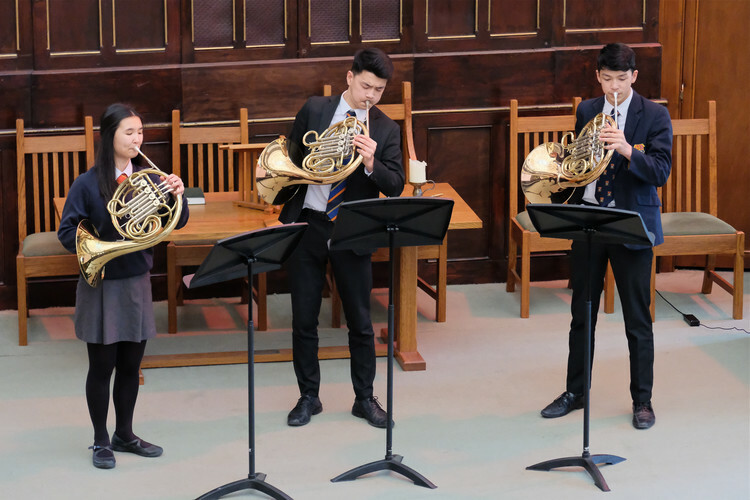 The last of the lunchtime concerts before the half term break featured two wonderful musicians playing two instruments that we do not often hear in a solo context. Fifi D was the first performer, playing the harp and demonstrating how wonderful and expressive this complex instrument can be. Her interpretation the piece ‘Impromptu-Caprice’ by the French composer Gabriel Pierné, clearly demonstrated Fifi’s skill as a harpist. She achieved a perfect balance between melody and accompaniment and produced a beautiful cantabile line throughout her performance. The acoustics at the church were also ideal for her instrument and she received a rapturous reception after her excellent performance. 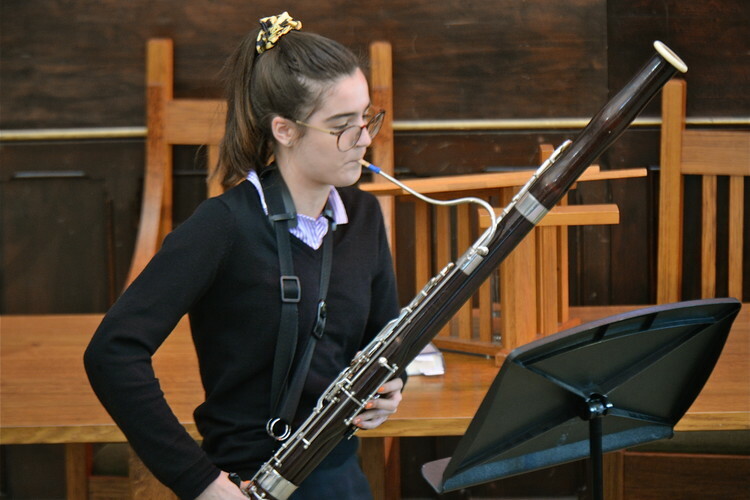 The second unusual solo instrument was the bassoon, played by Nadja V, who showcased the expressive qualities of this bass instrument with great mastery. The Sonata in F minor by Telemann, was a perfect vehicle for Nadja to demonstrate her command of the Baroque style and her ability to extract meaningful phrasing out of each of the four movements was unquestionable. Once again, the recital was a great success and it is great to see an ever-expanding audience attending this series of concerts. As usual, videos of the performances can be found through our website, our YouTube channel or by accessing the links bellow. The third of our concerts at Water Lane United Reformed Church focussed entirely on one instrument, the violin. 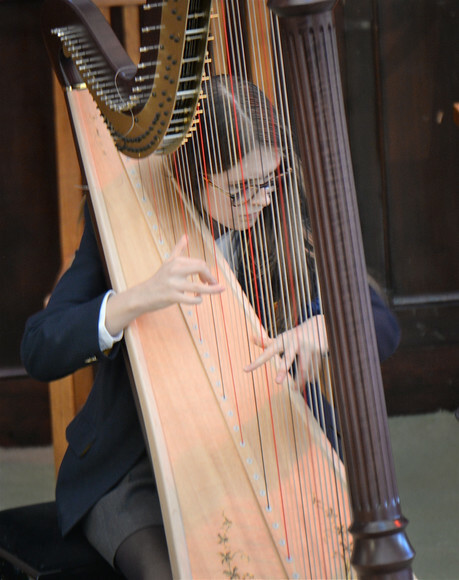 Elle X, currently in her final year in school, is one of our finest musicians and since joining the College has been a great contributor to the Music Department. Her skills as a violin player were clearly demonstrated in the recital last Thursday that featured works by Beethoven and Elgar. Elle performed the Romance in F major for Violin and Piano and the first movement of the Sonata in E minor Op. 82 by Elgar, accompanied by Mr David Arkell. They are both expansive and complex works that demand equal levels of technical dexterity and lyricism. Elle was able to bring to life the delicate melodic outlines of the Beethoven whilst retaining the drive and underlaying passion present in most of the works of the German master. Her performance of the Elgar sonata was full of drama and contrast. It also managed to both explore the cantabile and expressive elements of the music as much as the excitement of the fiery virtuoso passage work. The audience was very appreciative of their efforts and both Mr Arkell and Elle received generous applause at the end of their recital. 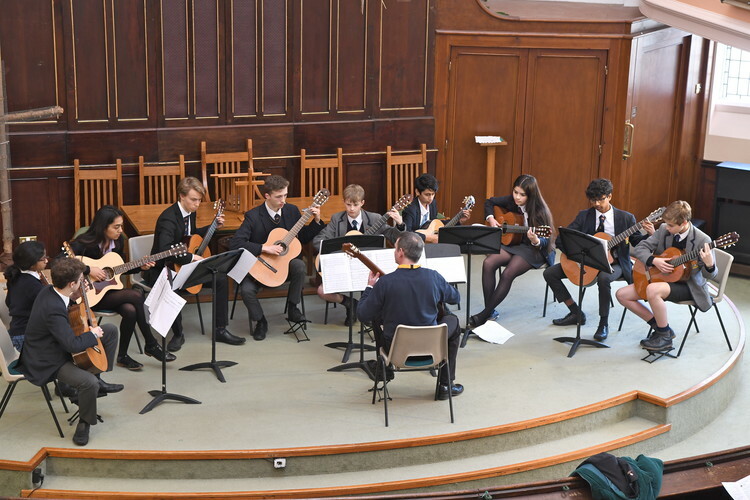 We are looking forward to the rest of the concerts in the series which will feature a singers’ concert, a chamber music recital and a guitar concert. The recitals are free and open to anyone every Thursday at 1.30pm. Our series of recitals at Water Lane United Reformed Church continues with last week’s concert featuring music for violin and French horn. 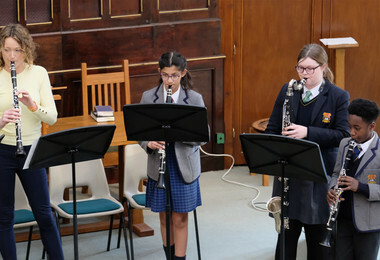 The three performers, Emma H, Charlie E and Daniel E, are outstanding young musicians with considerable stage experience. This was plainly evident throughout the concert as they were able to masterfully interpret a good number of challenging works. 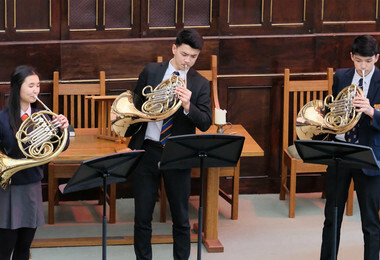 The recital began with two horn pieces, Hunter’s Moon by Gilbert Vinter and the first movement of Mozart’s Horn Concerto in D, played by Daniel and Charlie respectively. The horn is a demanding but rewarding instrument to master and even though they are both relatively new to it, both Charlie and Daniel have already developed a wonderful sound and tonal control. Emma presented to the audience two violin pieces linked to the famous virtuoso violin player Fritz Kreisler: Berceuse Romantique, one of his many melodic and expressive compositions and Danse Espagnole, a popular arrangement of a famous dance from an opera by Manuel de Falla. The last item in the programme was a delightful trio for horns titled ‘Call of the Horns’ by the composer Carol Butts. Emma, Charlie and Daniel performed this delightful ensemble that concluded an fantastic and well attended recital. With a few minutes to spare before 2:00, our performers introduced a surprise encore, ‘Stand by Me’, played by the two brothers as a horn duet and accompanied by Emma at the piano. 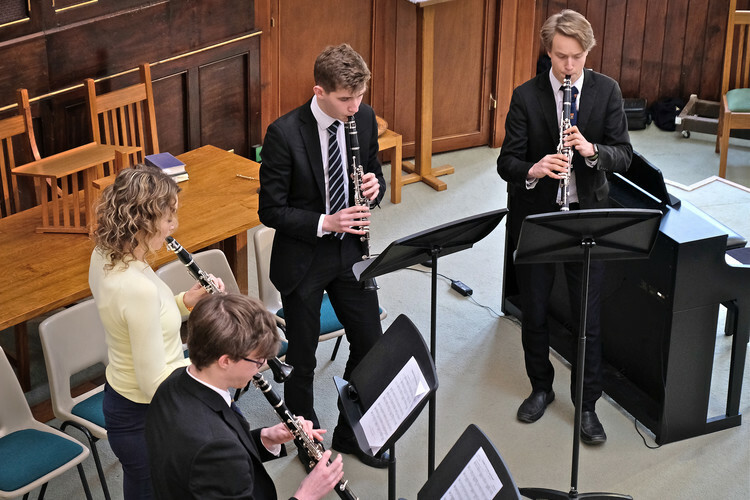 The video recording for the recital can be found at the link bellow and through our website and YouTube channel, it is possible to access a large number of concerts from this and previous academic years. 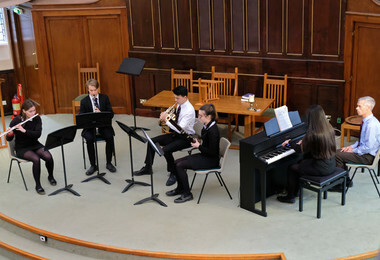 Thursday 24th January marked the start of the lunchtime recital series that the College musicians present annually to the Bishop’s Stortford community. This year, to mark the special anniversary of the College, we have moved the concert series to Water Lane United Reformed Church. This is not only a lovely venue for our young performers but it also has historical links with the school. 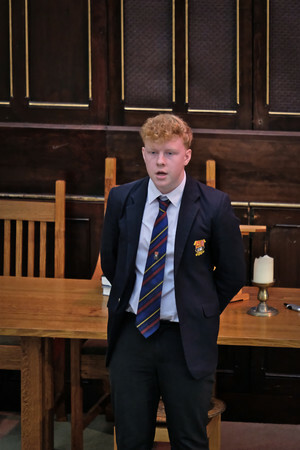 The church was intimately connected with the foundation of the College 150 years ago and for a very long time and before the construction of a chapel, the pupils travelled down to Water Lane for various services during the week. 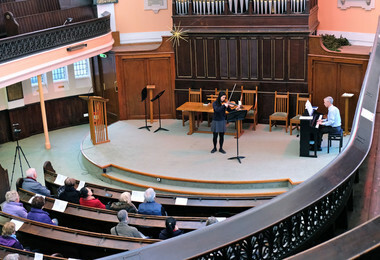 Starting the series of recitals, we had a group of three music scholars, Yuki C and Inez P playing the flute and Anthony T playing the violin. 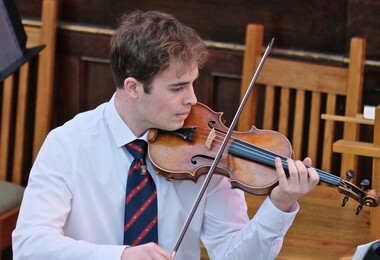 The start of the concert featured the first movement of Bach’s Violin Concerto in A minor, played with great character and conviction by Anthony. Inez and Yuki then performed a flute duet by Jean Baptiste Loeillet, followed by another solo flute work ‘Fantasie Pastoral Hongroise’ played by Inez. The recital finished with the first movement of the Kabalewski Violin Concerto. All performers were very accomplished and demonstrated excellent communication and expressive skills. 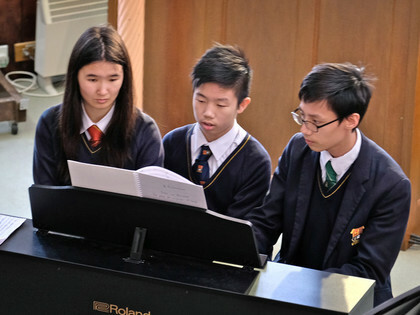 They were all skilfully accompanied by David Arkell, who once again demonstrated his mastery of the piano. 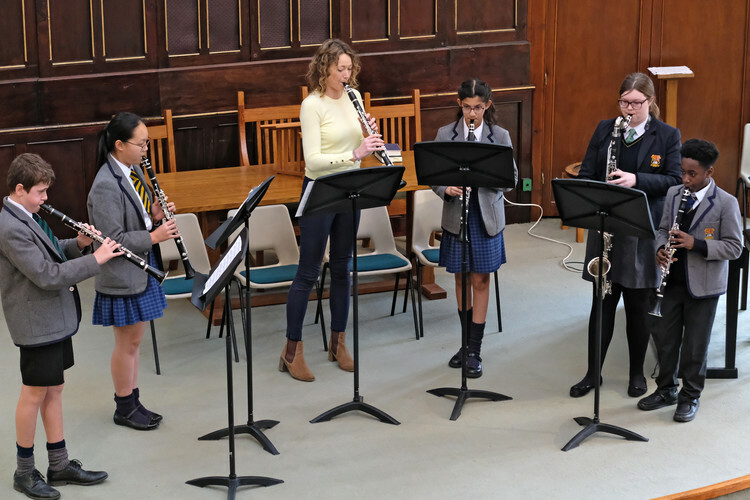 If you want to come and support future recitals, please join us at 13:30 every Thursday during this term at Water Lane United Reformed Church. 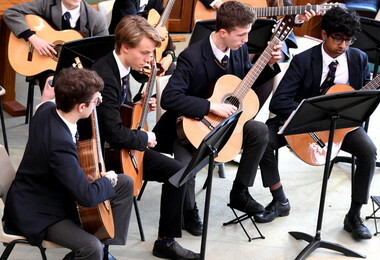 If you miss any of the performances, you can always watch the video recordings that will be posted through the news feed in the College website.
. Please click here to view the full programme.